Around 400 Russian built ships and submarines are already in service with the armed forces of 27 countries around the world. Even as India has delayed announcing the results of a tender to supply the Indian Navy with non-nuclear submarines, Delhi has approached Moscow regarding the sale of two of Russia’s newest Amur class submarines. Defence News noted this was done to circumvent a strict requirement of Indian law that any military procurement be conducted solely on the basis of a tender. According to the British website, India would only be able to take this step if she needed to procure such technology at very short notice. The Indian Navy is planning to procure six new submarines under Project 75I. The programme to supply these vessels has for a number of reasons fallen more than four years behind schedule. It is envisaged that the first of six submarines will be accepted into service this year. According to Indian expert and retired Captain Shyam Kumar Singh, the delays with Project 75I coupled with delays in delivery of the Scorpène submarines have led to a reduction in the Indian Navy’s submarine fleet to an almost critical level. In Captain Singh’s opinion, it is this shortage that has led to the start of direct talks with Russia. He believes that even if a tender were announced in the near future, it would take more than 10 years for the first of these submarines to be delivered. That is to say by that time not only would the submarines have been manufactured to obsolete specifications, but they would be fitted with ineffective naval weapons systems. In this case Russia is the only country capable not only of supplying submarines quickly, but of taking into account the customer’s requirements for the latest weaponry within the context of their own armed forces. In recent years Moscow has emerged among the global leaders in terms of supplying naval military technology and occupies 27 percent of the global market. According to President Vladimir Putin, the share of naval technology in the export portfolio of the state corporation Rosoboronexport is 15 percent. The order portfolio for the supply of Russian armament reached $50 billion. Around 400 Russian built ships and submarines are in service with the armed forces of 27 countries around the world. The popularity of Russian naval military technology lies in its comparatively low cost and its extremely high combat effectiveness says Ruslan Pukhov, Head of the Centre for Political Research (TsentrAST). Apart from that Russia is currently implementing a large-scale programme to modernise its own fleet. Billions of roubles have been invested in modernising production, as a result of which Russian yards have not only increased the rate at which military vessels are launched, but their quality has also improved considerably. Another significant aspect to the shipbuilding programme is that Russian Design Bureaus are offering both Russian naval personnel and those from overseas, ships and submarines manufactured according to a modular principle. These ‘modules’ are like ‘Lego’ building blocks with which a customer can put a military vessel together independently according to their specific requirements, integrating the weapons systems into its design. Large anti-submarine vessels such as the 11356, 11541 and the Gepard 3.9 (cheetah) designs, as well as the 20382 Tigr (tiger) corvettes, for which the hull and superstructure are manufactured using ‘stealth’ technology, as well as the small 12300 Skorpion (scorpion) and 20970 Katran (dogfish) missile launches serve as examples of this. They are completely different vessels in terms of displacement, class and also in the combat roles that they perform. They may however have weapons systems in common. This is also the case when it comes to the state of the art Russian anti-ship cruise missiles, the Klub-S for submarines and Klub-N for surface ships. There is also a Klub-M a coastal version of this missile, which apart from anything else can be hidden in an everyday ship container. This means that any dry cargo ship can be turned into a military strike vessel. The Klub missile systems are designed to strike surface ships, submarines and coastal assets under intensive fire and radio-electronic interference. They include the ZM-54E cruise missiles with a detachable supersonic warhead, which is capable of developing a speed of Mach 3.0 in its final stage, and overcome the air defence systems on practically any surface vessel. Another example is the 91RE1 system, which delivers a high-speed self-guiding torpedo with a range of 40-50 km designed to strike any submarine. The ZM-14E cruise missile designed to strike ground targets is capable of destroying any coastal assets within its range. 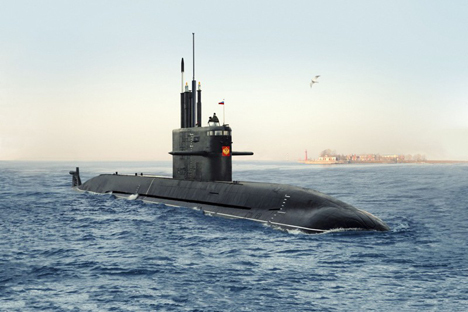 The Klub-S system is fitted to Russia’s newest Amur class submarines. At the behest of the customer the vessel can be fitted with the more powerful Russo-Indian BrahMos cruise missiles. The ‘modularity’ or as the automobile manufacturer would say optional extras in the design of a ship allow even a nation of modest means to procure a vessel, which is capable of posing a serious threat even to a larger and more powerful carrier force.